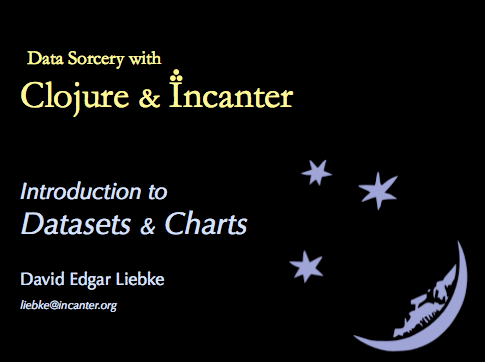 This entry was posted in Clojure, Incanter, jFreeChart, plotting, visualization. Bookmark the permalink. Thanks for catching that, I’ve fixed my copy of the slides and I’ll upload them in a bit. Should “mean” on slide 53 be “:mean” ? I had to change it to “:mean” to get it to work for me. Awesome features. $rollup is great. You probably didn’t import incanter.stats, which is where the mean function lives. You are pointing out a feature that I left out of the slides; the built-in rollup functions that can be used by providing a keyword argument (e.g. :mean, :sum, :min, :max) instead of an actual function.